Since the arrival of PlayStation 3 firmware 2.50, Sony added a recovery menu. In this tutorial we will see how to access and its functions. - While the PS3 is on, press and hold the power button until it turns off and stays red. - Release the button and press it again, but keeping it. The console will turn on, beep once and then make another beep. Without releasing the button, wait until your PS3 turns off. Again, release the button when we have the red light. - For last, press it again, keeping it. It will make a beep and wait until you hear a second beep. - Now, release the button and the recovery will show (it takes a few seconds to appear). Then we will have to connect the Sixaxis via USB and press the PS button. - Restart System: Restart the PLAYSTATION®3 System. - Restore Default Settings: Reset all system settings back to default. - Restore File System: Checks for corrupt/missing system files. - Rebuild Database: Rebuild the OS for the PLAYSTATION®3. 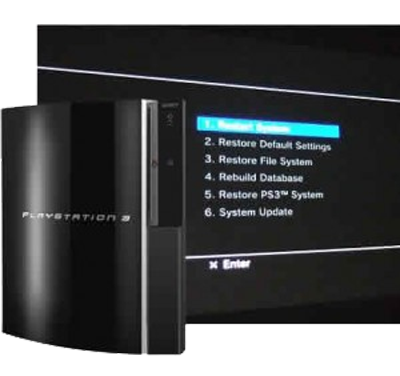 - Restore PS3 System: Format the HD and restart with default Settings. - System Update: Update the PLAYSTATION®3 System.